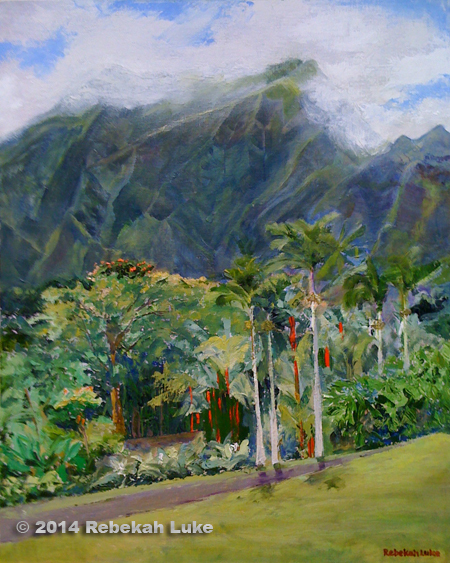 Our “If it’s Thursday, it must be Ho‘omaluhia!” public exhibit of paintings opens today at Ho‘omaluhia Botanical Garden visitor center and extends to August 30, 2010. 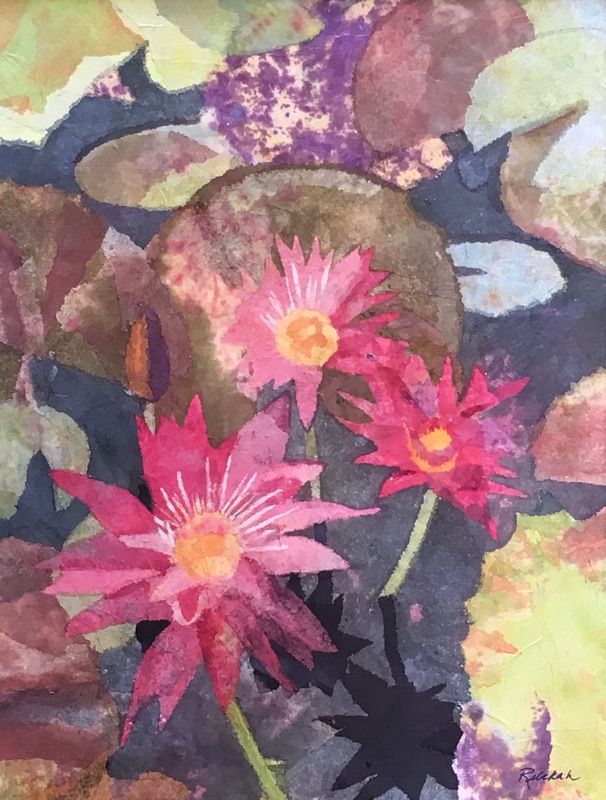 The show displays the works of local artists Alex Weinstein, K.Y. Lum, Naomi Weinstein, Noreen Naughton, Richard Guy, Val Saban, and yours truly Rebekah Luke. The collection looks great! 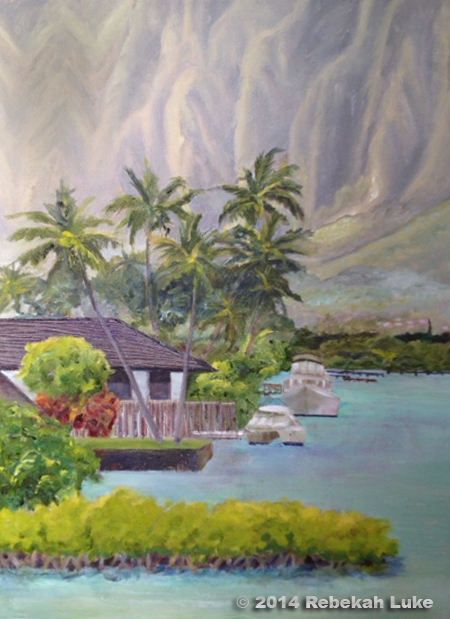 Every Thursday for the past 10 years, more or less, our group has painted in the peaceful landscape that is Ho‘omaluhia, located at Luluku, at the base of the majestic Ko‘olau mountains in windward Oahu. We come from different backgrounds and for different reasons to enjoy the garden and each other’s friendship. This the first exhibit of paintings for four of our group. All but one of the 42 works in oil and acrylic may be purchased, with prices ranging from $75 to $2,800. Most prices are reasonable and realistic for original art, so it’s a good opportunity to start or add to your collection. Interested buyers should contact the artists directly (lay away plan of installments considered), as no sales transactions are permitted on the city property. In the 1990s, art professor Noreen Naughton frequented Europe with summer abroad courses. K.Y. Lum, a psychiatrist, and his wife took the “Drawing in Italy” tour, visiting Rome and Tuscany to take in Renaissance art in hill towns and obscure churches. When they went a second time to Italy, Naomi and Alex Weinstein joined Noreen’s group. Alex, an architect, is a good sketcher, and Naomi, a retired educator, was a ceramist. They all went with Noreen again to paint in France, “Following the Path of the Impressionists” from Amsterdam to Paris. 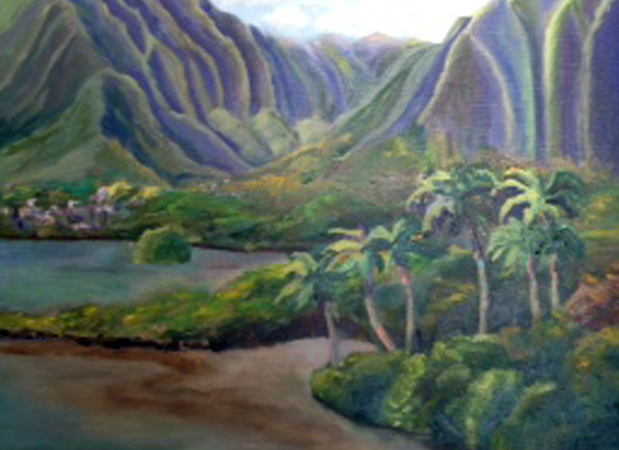 When they returned to Hawai‘i they continued to paint with Noreen in the landscape. Ho‘omaluhia Botanical Garden became a favorite venue. K.Y. and the Weinsteins are the only ones from Noreen’s original group who continue to paint together on Thursdays. The others: Val Saban, former international trader and industrialist, lives in the same building as K.Y., and the two swim together. Rebekah Luke (that’s me) who studied painting with the late Gloria Foss, and K.Y. are first cousins. Richard Guy, retired chief justice of Washington state and a local arbitrator and mediator, joined the group after being introduced by Naomi who is in the same book club as his wife. 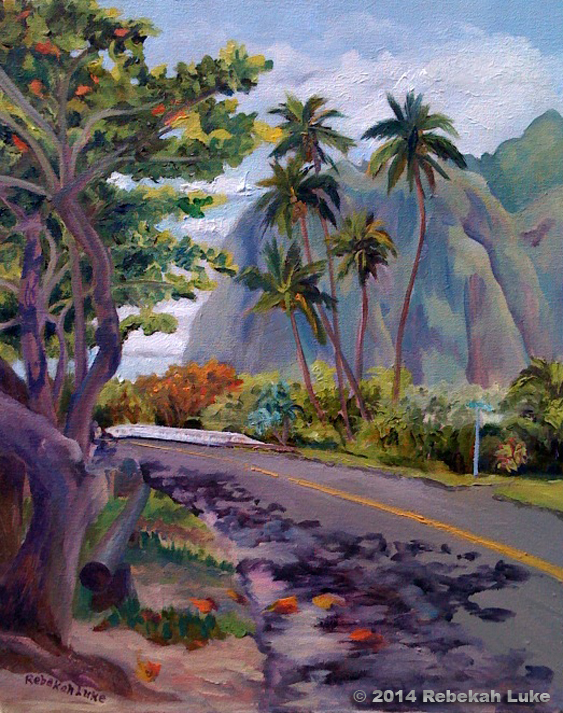 The park entrance is located at the end of Luluku Road in Kaneohe, Oahu. The art will be on view every day from 9 a.m. to 4 p.m. through August 30, 2010. Exception: The park is closed on Aug. 6 and 27. Thursday is the theme. You can meet the artists at a punch-and-cookies reception on Thursday, August 5, from noon to 2 p.m. Most of us will be there on the other Thursdays in August in the mornings only. Allow time to enjoy the rest of Ho‘omaluhia Botanical Garden’s plants, trails, picnic areas, lake, camp sites, and overall Hawaiian tropical scenery.